Carmen. May 15, 2015. The 2015 season started in May with a sizzling production of Bizet's Carmen at the residence of The Ambassador of Spain, H.E. Ramon Gil-Casares. The evening kicked off with a cocktail hour followed by a delectable meal of Spanish cuisine under the eves of the Ambassadorial residence. The presentation, starring Cristina Nassif (Carmen) and Javier Agullo (Don Jose) rounded out with an impressive cast providing an evening of beloved melodies and a passionate tale. Maestro Gregory Buchalter conducted the Chorus & Orchestra. Robin Phillips provided an enchanting narration for the presentation. Cosi fan tutte. November 6, 2015. The Opera Camerata of Washington continued a wonderful history of presenting the lighter side of opera, with Wolfgang Amadeus Mozart's "Cosi fan tutte" opera buffa. The program was preceded with a delightful cocktail hour and was orchestrated in an elegant, historical club in the heart of Washington, D.C. Attendees also enjoyed a dessert and coffee intermission during this amazing performance. Tosca. December 5, 2015. The finale of Opera Camerata's 2015 season was also the ending of our 25th year as a non-profit organization serving the arts community in Washington D.C.. The extravagant and evocative performance of Pucinni's Tosca was held in the beautiful and ornate ballroom in the Ambassador of Colombia to the U.S., H.E. Juan Carlos Pinzón. A delightful cocktail hour and dinner buffet preceded the performance in the elegant parlor of this historic home. The evening was concluded with a delightful champagne toast. The Barber of Seville. The Opera Camerata of Washington continued its heritage of artfully producing classic opera with Rossini's Barber of Seville in September 2014. Jose Sacin and Callie Wohletz led an extraordinary cast of performers. Presented in an elegant, historical club in the heart of Washington, D.C., the program was preceded with a cocktail reception coupled with exquisite hors d'oevres. This fast paced opera buffa, coupled with a full orchestra, was enjoyed by all! Madama Butterfly. The 2014 season culminated in a spectacular presentment of Puccini's, Madama Butterfly, at the residence of His Excellency, Kenichiro Sasae, Ambassador of Japan. The evening began with a cocktail reception and delightful dinner of Japanese cuisine. The show featured the internationally renowned talent of Asako Tamura, as Madama Butterfly and Sahoko Sato playing the role of Suzuki. An orchestra and chorus, coupled with the ambiance of the Ambassador's artful residence, provided an experience that was both elaborate and immersive that produced an authentically detailed production. President of the Opera Camerata Board, Randall Roe, also presented an award to Founder and Director Emeritus, Michael Reilly, upon his retirement for his contributions to the organization. The Magic Flute. The Opera Camerata of Washington embarked on its 23rd season of producing fine opera in salon settings in the Nation’s Capital on Apr. 28, 2013 with a production of Mozart’s The Magic Flute at the grand Residence of the Ambassador of Colombia, Mr. Carlos Urrútia. The evening began in this elegant Dupont Circle mansion with a cocktail reception and silent auction and concluded with a lavish dinner buffet following a narrated, fully-staged performance with a full orchestra and chorus..
Pagliacci. In June, 2013, our production of Pagliacci at the Historic Fairfax Hotel on Embassy Row was hosted by the Ambassador of the Hellenic Republic, H.E. Christos Panagopoulos. Guests, musicians and performers mingled during a lovely cocktail reception with piano music before assembling in the grand ballroom for this fully-staged production. Maestro Gregory Buchalter conducted the Chorus & Orchestra. The performance featured Anastasia Jamieson and Benjamin Sloman. Narration provided by Stefan Lopatkiewicz. The Scene Bisnow featured this exquisite opera event. 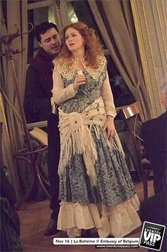 La Boheme. The Season concluded in November with a black tie gala production of Puccini’s famous La Boheme at the spectacular Residence of the Ambassador of Belgium, H.E. Jan Matthysen on Foxhall Road. A lovely cocktail reception with a silent auction was followed by a delicious dinner buffet featuring Belgian cuisine. The fully-staged production was conducted by Maestra Lucy Arner, with Robin Phillips narrating. Principal singers featured Jesús Daniel Hernández, Olga Orlovskaya, José Sacín and Evelyn Thatcher. The evening was featured in The Washington Post style section and in The Georgetowner.